This Nissan Altima and Oldsmobile Cutlass collided Monday night at Northwest 31st Avenue and Northwest Sixth Street near Fort Lauderdale. FORT LAUDERDALE, Fla. - Three people were injured when two cars collided Monday night near Fort Lauderdale. 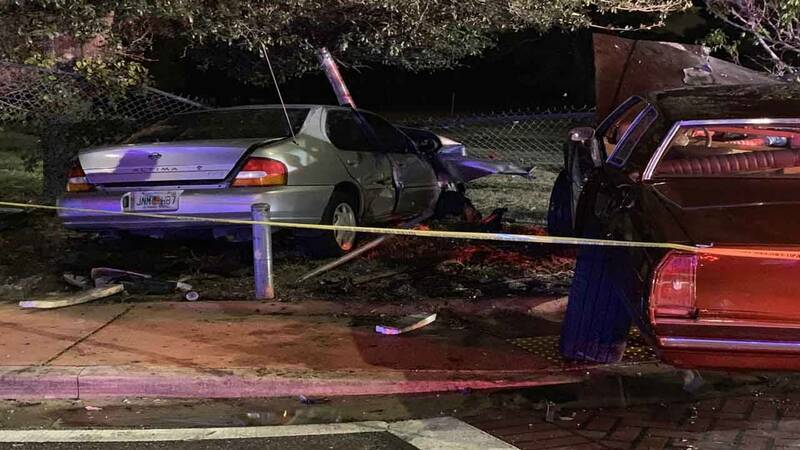 Broward Sheriff's Office Department of Fire Rescue Battalion Chief Michael Kane said a Nissan Altima and Oldsmobile Cutlass collided just before 9:30 p.m. at Northwest 31st Avenue and Northwest Sixth Street. Kane said the impact was so severe that one of the wheels of the Cutlass was torn off before the car struck a fence. A woman and two men were taken to a hospital with non-life-threatening injuries.